The last issue was lit. Lit, as in a fuse was lit on a powder keg of impending war between a group of, what's the term now? "Alt-right"? "White nationalists"? No, I think white supremacists still applies as Abner and his faction of neo-nazis are coming for one of their own in Eden. Mayor Shiffron has to ready the troops to protect the former Aryan, Rowan, and the town. Mark's counsel becomes invaluable as issue fourteen is the calm before the storm. After an action-packed last issue, the dust settles leaving Mama Shiffron with a lot of thinking to do. She's suddenly consensus-building asking Mark, Maggie, and the sheriff if they should go to war. I don't think there ever was a question that they'd go to war but two other developments were surprising turns in prepping for battle. Mark enlists the advice of the caged psycho Molly. It's an engrossing scene as Mark picks her brain about a "puzzle" he's trying to solve. Unfortunately, Molly still holds Mark under her spell, manipulating him, molding him like clay. She's in his head and he knows it. Elsewhere, Abner readies his Aryan brothers but one, in particular, Carpenter, has a special mission. He's clearly more dangerous and actually very intelligent. I was not prepared for that but he's also more devout to the cause than even Abner. It sets the stage for a very ruthless encounter in Eden for sure. Bryan Hill has introduced characters that are clearly evil but only shades darker than our normal batch of "protagonists." After all, Eden was built by a very bad man. We get a glimpse of what Isaac Shiffron's influence was on his wife and Mayor, Laura Shiffron, at the beginning of the issue. Since then everyone who's set foot in Eden falls somewhere on the bad scale. Mark might be the only innocent in town but what is innocent anyway? Hill enjoys challenging the reader's idea of right and wrong. Could a former neo-nazi be redeemable? Is imprisoning a sociopath without due process justice? The very idea of a town made up of criminals seeking asylum under the protection of the FBI is an affront to the rule of law. Yet, Hill also makes us find sympathy for people who generally wouldn't deserve it based on our own sense or morality. I keep saying Isaac Goodhart's art continues to get better and better. It's no coincidence that as the series has gotten more engrossing and shocking so has the level of excellence in the art. Goodhart has been taking more risks, challenging himself, avoiding common grid panels and offering readers dynamic layouts that move the eye and keep things moving. His character designs have also grown sharper. There is nary a false note in his sequential art. K. Michael Russell's colors add the proper warmth to scenes that all take place either at night or at dawn. Whether it's the light of a lantern or a burning cross, Russell mixes his yellows and orange to create a warm setting amid all the cold-blooded plans to go to war. 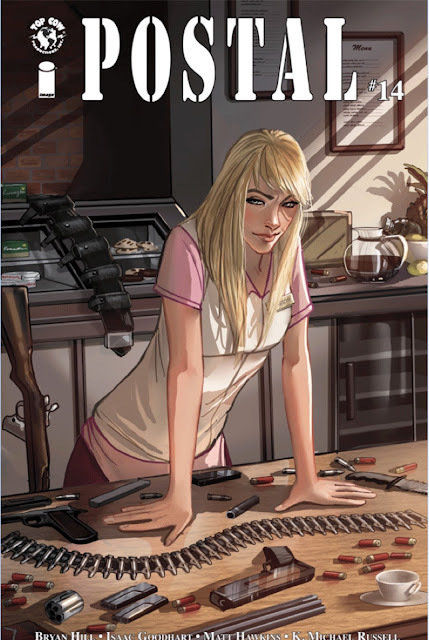 'Postal' is gearing up for war and such things are inevitable when you deal with criminals of every ilk. A town whose city limits can't keep out the past, the sins that brought its residents there in the first place. Hill muddies the waters again about who is righteous and who is damned. Considering war is coming to Eden, we'll have to wait and see how God sorts them out. It's going to be a barn-burner for sure.